What is a "cue sheet"? A cue sheet is a simplified description of how to follow a route, easy to refer to at a glance while on the trail. Directions are boiled down to the bare minimum needed to answer the question "where do I turn next?" For example: "turn left at River Road, go for one mile, turn right on Community Bike Path, go for 50 feet" and so on. Cue sheets are meant to be read going one way. When headed the opposite direction, you would transpose the directions (lefts become rights, and so on) ( are we not drawn onward, we few, drawn onward to new era? ). 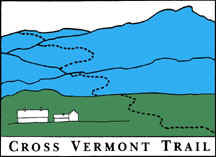 To avoid the need for trail side transposition, we provide two versions of every Cross Vermont Trail cue sheet. One is written "east to west" and the other is written "west to east." Note that you might actually be headed a variety of compass directions on any given cue sheet. You can link to single long cue sheets covering for the entire 90 mile statewide route on the guidebook main page. Or, on the map index page, you can find the same information broken out into a series of shorter sheets accompanying the series of printable maps. For a more detailed narrative desciption of the route, with links to photos, read the online guidebook.